What was the plane that crashed in Malta really doing? As the initial shock of this morning's Luqa plane crash began to subside, a key question gradually began to emerge - what was the French aircraft doing in Luqa in the first place? Sources speaking in the immediate aftermath of the crash said the plane had been carrying officials working for Frontex, the EU's border management agency. That was swiftly denied by the agency itself in a short tweet. The Maltese government subsequently issued a statement saying the plane had been part of a French "customs surveillance operation which had been taking place for the past five months." The operation, the government said, involved tracing routes used by various traffickers throughout the Mediterranean. But if that one-line explanation may have seemed plausible, subsequent statements by French authorities suggest something else was afoot. First, French Customs issued a tweet saying that none of its officials were aboard the fated flight. EU Foreign Affairs High Commissioner Federica Mogherini's tweet saying that the flight was "not related" to any EU activities also raised eyebrows, given Maltese government claims that the plane was intended to trace trafficking routes - a key component of the EU's Sophia mission in the Mediterranean. Then, Le Monde quoted French Defence Minister Jean-Yves Le Drian as saying three of the crew members on board were employed by the ministry's external security directorate, the DGSE. Last February, Le Monde had infuriated the French government by reporting that France was using DGSE officials to carry out covert operations in Libya, with the paper quoting an unnamed senior defence official as saying "We must avoid open military engagement [in Libya], we must act discreetly." Le Monde's reporting of this "secret war" prompted a livid minister Jean-Yves Le Drian to launch a criminal investigation into the paper, saying it had compromised a military secret. French President Francois Hollande indirectly confirmed the existence of such operations last July, after he said that three French soldiers who died after their helicopter had been shot down in Libya were carrying out "dangerous intelligence operations". Further questions about this morning's crash arise from the plane itself. Aside from lacking any colours or identification marks on its livery, the plane - a Fairchild Metroliner turboprop - was an altogether different model from the Falcon 50M planes used by France for reconnaissance activities it performed for the EU's Sophia mission, sources told Times of Malta. Home Affairs Minister Carmelo Abela appeared visibly uncomfortable when pressed to confirm or deny that the five crew members aboard this morning's flight were actually military personnel this afternoon. 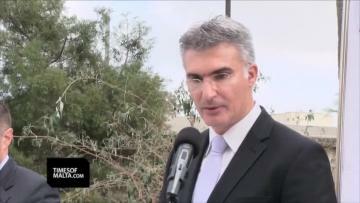 Speaking during a press conference (see video), Dr Abela said he would like to stick to the government's official statement. Dr Abela, whose answers were punctuated by long pauses, said it was "not the case" that the plane was heading to Libya, as reported in different sections of the media, and refused to say whether the plane's mission was a bilateral mission. The surveillance operation was taking place "in the region", the minister said vaguely. 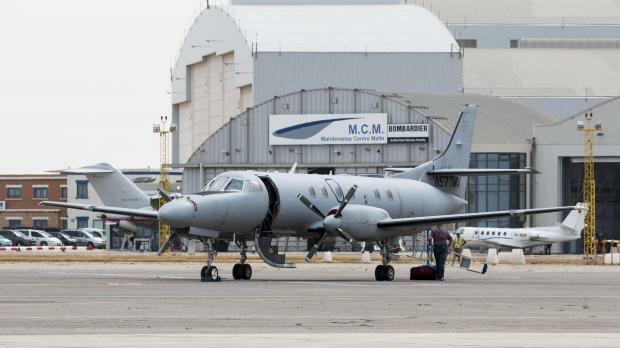 Should it result that the Fairchild Metroliner that crashed this morning was indeed involved in covert operations within Libya, the revelation could damage Maltese-Libyan relations. Although it remains a nation in turmoil, Libya remains a sovereign state, with borders other nations cannot violate without a clear United Nations security council mandate. The debris may have been cleared, but it seems fallout from this morning's crash of a French surveillance plane in Luqa has only just begun.